Cam's Cinematic Episodes: Film Review - PRIDE AND GLORY: Cop-Bland. 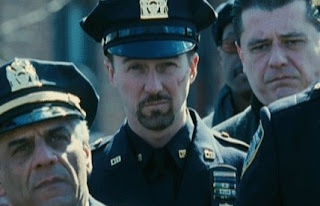 Film Review - PRIDE AND GLORY: Cop-Bland. I’m not sure that it is humanly possible to come up with a more bland film title than Pride And Glory. If I didn’t know any better, I’d swear it was a soppy made-for-Hallmark World War II drama... Or maybe a Zakk Wylde biopic, which would actually be pretty badass. But unfortunately no, Pride and Glory is, in reality, one half gritty crime saga and one half monotonous working-class family drama. Throw the two in the ol’ movie blender and what do you get? Over two hours of unremarkable, snail-paced clichés that will manage, no matter how hard you fight it, to evaporate from your cerebral cortex within an hour of viewing. 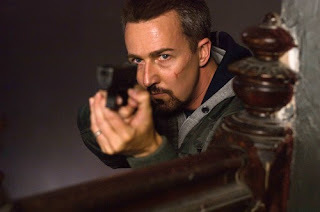 Surprising, considering the involvement of the uber-talented Edward Norton who, Death to Smoochy aside, usually shows impeccable taste in his projects. 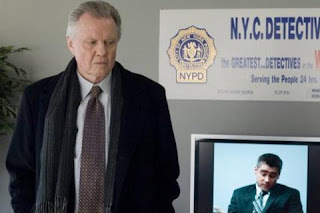 He plays detecti ve Ray Tierney, an emotionally and physically scarred NYPD officer who, after a disastrous on-the-job event, has buried himself within the safe confines of the missing persons department. But, as we in the peanut gallery have seen innumerable times before, Ray is destined to become embroiled in a “Big Case”, which of course threatens to Bring. Down. The. Entire. Department. I should mention of course, that Ray is coaxed into taking on the job, which involves a bust-gone-bad that led to the snuffing-out of four fellow officers, by his frequently sloshed father Francis Sr. (Jon Voight – doing a pretty nifty Brooklyn accent), who fears for the reputation of older brother Francis Jr. (Noah Emmerich), the department’s chief inspector. While Ray follows leads, interrogating standard ethnic witnesses and suspects, we are speedily informed that it is actually his shifty brother-in-law Jimmy (Colin Farrell) who is behind all the madness. Unfortunately for us in the audience, it takes Ray and the family most of Pride and Glory’s running time to catch up. 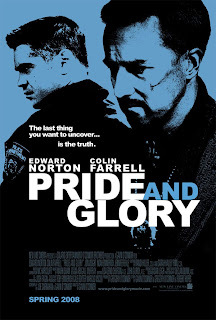 Watching Pride and Glory you become acutely aware that dire ctor/screenwriter Gavin O’Connor (who previously made the Disney hockey flick Miracle) was obviously far too inspired by episodic TV cop shows ala NYPD Blue and The Shield. There are countless sub-plots, which, after developing, go absolutely nowhere. For example: Francis Jr.’s wife (Jennifer Ehle) suffers from cancer. We are repeatedly shown and informed of this fact, and are even treated to a scene in which she breaks down in tears, practically smashing her tiny fists against the ground in impotent frustration. It’s never discussed or referenced afterwards. Why? Why, at the halfway point, is a reporter introduced to the story and made to witness the murder of an important character? Will his ensuing expose act as a catalyst fo r the dismantling of the department’s web of corruption? Nope, after asking for Ray’s input he is dismissed and vanishes inexplicably from the film. In a televised drama, these threads would likely have been explored, and a broader fictional world would have resulted, but here they're just pointless throw-away details. In fact, I don’t think I’d be wildly off-base in suggesting that O’Connor could have cut about half an hour out of the film (including the dreadful fist-fight climax, please) with no negative effect. The resulting edit would probably be a more enjoyable film, for at least it would be over quicker. Strangely enough, the actors are all quite fine, if completely unmemorable. I’ve long suspected that No rton is so gifted that he could give a brilliant performance in his sleep. On the basis of Pride and Glory, consider this theory officially verified. In addition, Noah Emmerich, playing the family’s most conflicted member, has the most challenging role and delivers swimmingly, while Jon Voight, an actor infamous for basically playing himself, is really on the ball. Possibly due to the challenge in keeping up with his phenomenally talented co-stars, Voight seems alive in a way I haven’t witnessed since his last memorable turn in, um, Anaconda. In a better film, he would likely have raised at least a glimmer of awards season buzz. Colin Farrell is downright batty. Seemingly exhausted, bloated and haggard, with his Irish brogue frequently slipping out, one has to wonder if the film was shot righ t before his recent stint in rehab. Still, he does have the film’s only memorable scene: busting up an immigrant family’s Christmas dinner and attempting to scald their baby’s head with a hot iron. Though, to be fair, that would likely be the most memorable scene in any movie. But please, if you are truly desperate for a gritty cop thriller filled to the brim with tense racial situations, corruption and profanity, check out the unfairly ignored 2002 Kurt Russell film Dark Blue. It’s an appropriate alternative to Pride and Glory, which is almost staggeringly generic, a film destined for a DVD bargain bin near you very, very soon. *Originally printed in SFU's The Peak: Nov. 3rd, 2008. Film Review - SAW V: The Game Remains The Same.